At Schmitt Heating & Air Conditioning, we strive to understand and use the latest tools and technology in the HVAC industry. Smart thermostats are becoming more and more popular for homeowners. They are able to be adjusted remotely with internet access, and they can save customers money on their utility bills if used properly. That’s why we have begun carrying and installing top-of-the-line Carrier brand smart thermostats. 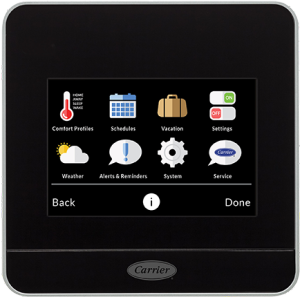 Carrier Cor series smart thermostats are a great starting point for those who want to upgrade from a basic thermostat. The Cor series has a smart setback feature that lets the device intelligently adapt beyond manual programming so that your heating and air conditioning system is running more efficiently. The thermostat even gives you energy reports to show you where the brunt of your utility expenses are going, and it also offers you energy saving tips. If you have a Carrier brand heat pump and furnace, the Cor series’ energy smart design can work with the units in a system called Hybrid Heat, which further saves you on utility costs. Carrier reports an average savings of 20 percent on customers’ energy costs for those who own a Cor smart thermostat. The Cor series features a full-color touch screen, and the device can be remotely accessed via an Apple or Android app, or anywhere you can access the internet. That means you can stop the system from running while you’re out and about, and you can turn it back on to get ready for your arrival home. Whereas the Carrier Cor series functions for customers who want to get into the smart thermostat market on a budget, Carrier’s Infinity series has unrivaled bells and whistles for those who want the best product on the market. The Infinity series can manage the temperature, humidity, ventilation, airflow and indoor air quality of up eight different zones in a building. If you also have a Carrier heat pump and furnace, the Infinity series can enable the Carrier Hybrid Heat system. The device can also automatically change over from heating to cooling, and it can detect dirty filters and give you reminders on when to change them. Two of the three Carrier Infinity models feature Wi-Fi enabled remote access from an Apple or Android app – or simply from any computer connected to the internet. Additionally, you can upload photos to the Infinity device and scroll through them on the thermostat’s full-color, intuitive touch screen. The Infinity series, which comes with a 10-year limited warranty, helps customers save big money over time, and gives them the ability to control the atmosphere in their home or business in ways never seen before. Schmitt Heating & Air Conditioning professionals will help you with the process of deciding which Wi-Fi thermostat could work best with your home or business and with your budget. Once you’ve picked the right one for you, our technicians will remove your old thermostat and get you set up with a brand new smart device. Ready to See Which Smart Thermostat Will be Best for Your Home or Business in the San Francisco Bay Area?